Is there anyone who doesn't love mangoes????. We all wait for this month of mango season. From a food blogger's view, I have so many plans to prepare recipes with it, but often it fails. I love to devour the mango as it is. 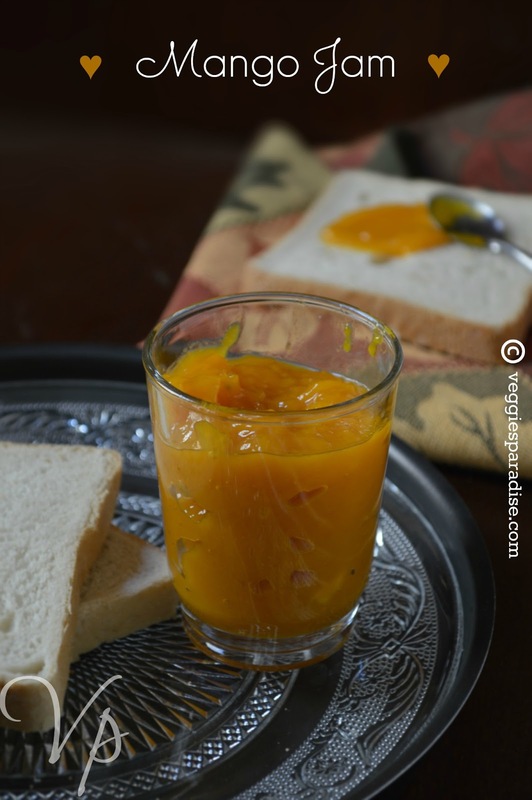 Earlier I have posted a Mango Milkshake recipe and now I am here with a recipe for mango jam, which is quick and easy to prepare. Home made jams are very special, as it's natural and most important the amount of sugar can be controlled and if needed we can also add flavoring ingredients to give an extra zing to these homemade preparation and definitely free from preservatives or chemicals. Store brought fruit preserves add pectin, most often used in jams and jellies to thicken.Pectin is either in liquid or powder form and the reason they add in jam and jellies , is because the amount of pectin in fruits varies and hence these water soluble fiber, is used especially in high sugar products to thicken without reducing the quantity. So why to go for these ready made jams , when it can be prepared very easily at our home and with no pectin. Mango, sugar and lemon juice, these are the three main ingredients used to prepare this delicious jam . Combine them all in a wide saucepan and cook in a low heat until the sugar dissolves and the whole mixture turns thick. Remove from heat and store in sterilized jars. This is a standard procedure and all kinds of fruits can be prepared this way by adjusting the amount of sugar and lemon juice. Place the mangoes, sugar, lemon juice, dry ginger powder in a wide saucepan .Cook over medium high,until the sugar dissolves and the mixture comes to a boil. Keep stirring until the jam thickens. now to check the consistency, place a spoonful of jam on a small plate and keep it in the fridge for a minute or two. Touch it with your finger and if it wrinkles, it's ready. If not, boil it for another 5 or 10 minutes and then check again stirring occasionally. when the jam is ready , remove the saucepan from heat and let it sit for 10 minutes or until the edges of the jam sets slightly. Store them in clean glass jar and refrigerate. Home-made always the best !!! looks delicious and awesome clicks. Love mangoes in any form..yummy! Homemade jam looks yummy and mouthwatering..
Another lovely way to enjoy mangoes!! Home made is the best.looks yummy. awesome recipe to store mango! love your blog dear and happy to follow you.please visit my blog too! 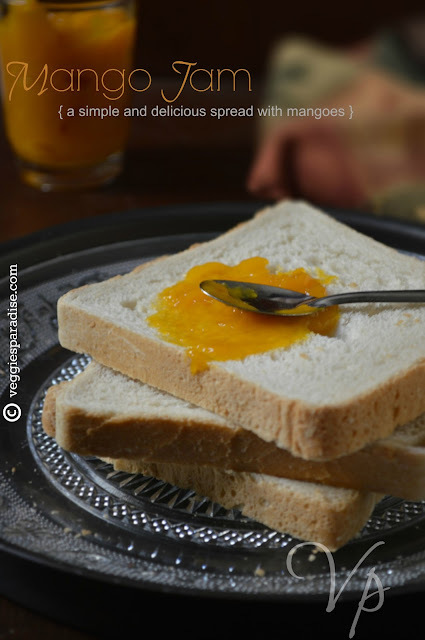 Mango Jam...with just simple method, amazing!Thanks for sharing Aruna.